The middle square is a mixed media background (scrap paper glued on scrap card covered with gesso and white acrylic paint). There was some blue ink on the scraps, that seeped through the layers. Texture paste has been added through TH bubbles and there's Stampendous Chunky white embossing enamel, some half pearls and white thread. 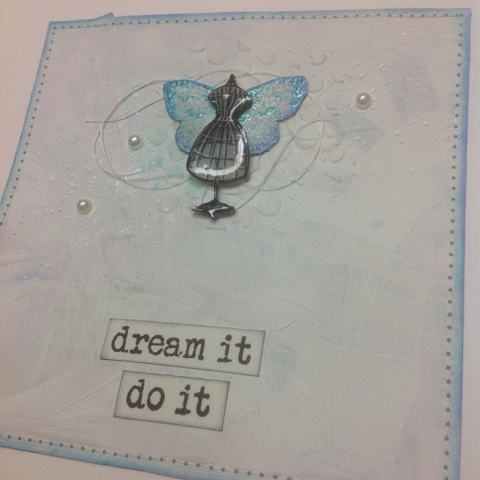 The stamps I used are all from Rubber Dance Art Stamps, butterfly wings from Antique Botanicals, mannequin from Sew Sweet (stamped on shrink plastic and covered with Glossy Accents) and text from Affirmations. I used washi tape to mask the text while spreading ink so I could stamp the parts I wanted. I cut a piece of white cardstock to measure the frame (from Ikea), eyeballed the center square in place and sewed around it. Oh, and some blue Distress inks were involved with the edges before sewing :) Here's a picture I took before placing the piece inside the frame. 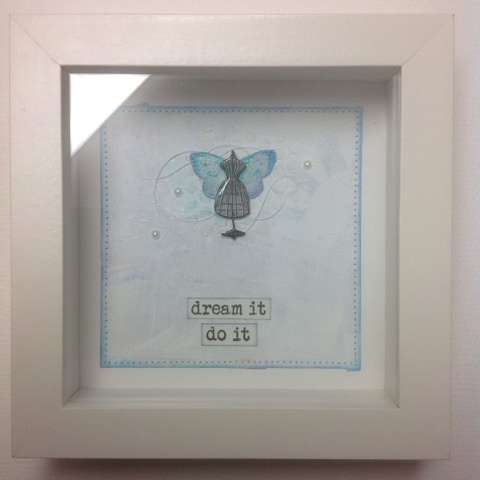 Beautiful framed artwork, Kristiina! The colours are so pretty and elegant. Love how you used my mannequin stamp - looks really cool on shrink plastic with that glossy finish!! Thank you so much!